Details of the Royal Opera House's 2018/19 Season have been announced. 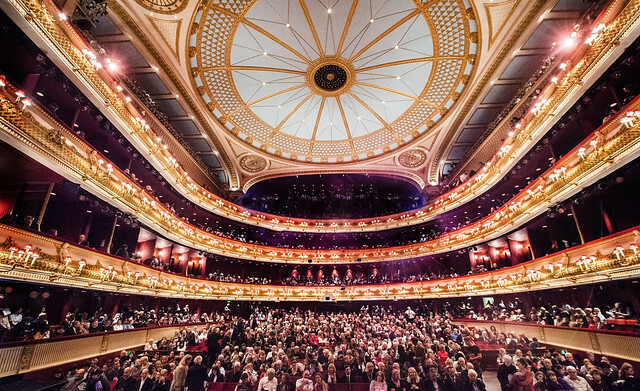 The Royal Opera's Season includes five new productions, classic revivals and operas that span the entire breadth of the repertory, opening with Wagner’s Ring cycle, conducted by Music Director Antonio Pappano, in a final outing for Keith Warner’s acclaimed production. The Season also includes co-productions of Christof Loy’s production of Verdi's La forza del destino and Stefan Herheim’s staging of Tchaikovsky's The Queen of Spades. Richard Jones continues our Janáček cycle, staging Katya Kabanova, and Deborah Warner returns to the Royal Opera House with an acclaimed new production of Billy Budd, opening a series of operas by one of the UK’s greatest composers, Benjamin Britten. The Royal Opera is also planning a cycle of works for families over the next few Seasons, beginning this Christmas when director/designer Antony McDonald creates a production of Humperdinck's Hansel and Gretel for all ages. As well as a commitment to a broad range of new productions, this Season nods to The Royal Opera's heritage, with a performance of Handel's oratorio Solomon, which was originally premiered at Covent Garden in 1749. Bizet's Carmen directed by Barrie Kosky, Mozart's Così fan tutte directed by Jan Philipp Gloger, Mussorgsky's Boris Godunov directed by Richard Jones, and Giordano's Andrea Chénier, directed by David McVicar will return for their first revivals. La traviata, The Marriage of Figaro, and Tosca also return to the Royal Opera House. The Royal Ballet's Season celebrates the rich ballet repertory spanning three centuries of heritage, contemporary and new works, with five world premieres including a new one-act ballet by Alastair Marriott to a commissioned score by Dario Marianelli, with set design by Es Devlin. Three further new one-act ballets will be performed this Season: a new work by Sidi Larbi Cherkaoui, and a new work by Aletta Collins set to a commissioned score by David Sawer as part of the Linbury Theatre season. The Royal Ballet School will also perform a new one-act ballet, choreographed by Liam Scarlett. The Royal Ballet will be going on tour to Los Angeles to perform the first part of a new full-length work by Wayne McGregor, with a commissioned score by Thomas Adès and designs by Tacita Dean. The work is presented as part of a large-scale collaboration, spanning two years, in partnership with the LA Phil, Glorya Kaufman Presents Dance at The Music Center, The Royal Ballet and Company Wayne McGregor. The Season will feature a number of revivals from the 19th century including: La Bayadère, Don Quixote, The Nutcracker and the 20th century, including: The Firebird, Fredrick Ashton's Les Patineurs, The Two Pigeons, A Month in the Country, Kenneth MacMillan's Winter Dreams, Mayerling, and Romeo and Juliet, Jerome Robbins's The Concert and George Balanchine's Symphony in C.
Modern day revivals in the 2018/19 Season include Asphodel Meadows and Frankenstein by Liam Scarlett, Within the Golden Hour by Christopher Wheeldon, with new design by Jasper Conran, Infra by Wayne McGregor, and Flight Pattern by Crystal Pite. Tickets for the 2018/19 Cinema Season go on sale on Tuesday 4 April 2018 in the UK and on Tuesday 12 June 2018 for international territories. Tickets for the 2018/19 Season at the Royal Opera House go on sale to the general public on 25 July 2018. What are you most looking forward to seeing in the 2018/19 Season? I am not overjoyed that The Nutcracker is to return for yet another Christmas. Perhaps Kevin O'Hare has forgotten that there are other ballets in the company's repertoire which can work just as well over the Christmas period? Ashton's Cinderella (out of favour for several years) is but one example. Please ask Kevin O'Hare to vary the Christmas diet a little bit. One of the crown jewels in the Company's repertoire and Ed Watson is certainly a wonderful Rudolf. Mayerling is one of those ballets that gives several dancers a chance to shine and that is exactly what happened in the last run (in Spring 2016). I was lucky enough to see each cast and thought that all of the different Rudolfs and Mary Vetseras hit the mark, albeit in different ways. Agree...it would be great to see Ed Watson perform the lead role in Mayerling once again. You should AT LEAST add the singers to your new productions as I (and the most visitors will agree with me) go NEVER to the opera because of a director but ALWAYS because of the singers ..sometimes because of the conductor! Totally agree with Petra. The first question any opera-goer asks is: who is singing? The director is certainly not a selling point (though there are some directors whose work I would definitely avoid!). I agree entirely. The Royal Opera now has very few productions I want to see again and too many which put me off going at all. The singing is the most important thing in opera at this level. At last the Royal Opera House has announced its new season, especially since many other European houses announced theirs months ago. Not the most exciting program ever devised, besides La Forza Del Destino which is rumoured to have the big guns of Kaufmann and Netrebko, there's not much to write home about. The controversial Carmen is returning and I wonder if that will last more than one revival, and Baroque opera is again thinly represented with a Handel oratorio. Come on what about a new production of Alcina, or Rinaldo ? It's not as if the current operatic world isn't short of exciting early music singers gracing many opera houses. The verdict on ROH 2018/19, could be better. ROH is not really suitable for baroque opera which needs a smaller and more intimate venue. ENO does plenty of baroque opera - in the biggest theatre in London! No reason Covent Garden shouldn't. ENO do Handel but not in a performing style that Handel himself would recognise at all. Mayerling! Loved Bonelli and Morera in the roles and I really hope they get the live screening! I'm looking forward to The Two Pigeons and Romeo and Juliet!!! Please, please, please have them in September/August 2018!!! I just realised that the ballets have already been scheduled... I'll see if I can come! ‘Firebird’! Saw Fonteyn dance it - beautiful ballet! Love Ashton’s ‘Les Patineurs’ too - looking forward to it all. Only one female choreographer on the main stage ? Yes, that's correct. We're very pleased to be welcoming Crystal Pite back to the Royal Opera House after Flight Pattern was so well-received. We know there is currently a gender diversity issue among choreographers (and in the performing arts as a whole) but we're working hard to take action to readdress these gender imbalances. We will be announcing more works by female choreographers later in the Season when we reveal our full Linbury programme. Not living in London, I can't always get to see things on the stage, so a bit of a shame that Hansel and Gretel and Billy Budd aren't getting live transmissions as those are things I'd quite like to see (especially since there are only five operas getting cinema broadcasts this year, one of which is a part of a larger piece). However, I'm glad The Queen of Spades is getting a cinema broadcast, and will likely see some of the other ballets and operas being screened. Also really interested in seeing the mixed programme with The Firebird in it (especially since there's a Saturday matinee for one performance so will be easier to get to) as it's one of my favourite pieces of classical music. Most looking forward to hopefully swapping my Ring (cycle 3) tickets as I now can’t make it! Do you still want to sell your tickets? Please send details of your available tickets as I really want to buy 2 Tickets for the whole Cycle. Wow! Frankenstien, Mayerling and Romeo and Juliet! I will need to start saving now. Amazing season announcement, so exciting. Really looking forward to seeing Mayerling and Don Quixote. Love watching Steven McRae, Frankie Hayward and Alexander Campbell. Hoping to come down to London to see the Nutcracker live this year. Fingers crossed. Think it's a good varied programme. Wonderful to have Mayerling back so soon! Is there any chance of a recording of the score being made available? as far as I can find, there hasn't been one yet. What a fantastic Royal Ballet Season ! The long awaiting return of La Bayadère, Don Quixote, Firebird and George Balanchine's Symphony in C.
I would absolutely love to see Angela Gheorghiu in Fedora. Please ROH!!! Also, Gheorghiu in La Boheme would be such a treat! Gheorghiu in anything other than Tosca would be a real treat. That is a disappointment I must say - what happened to the anticipated Fedora, Konigskinder and Liebesverbot? At least one or two rarities per season would be fair. Missed this announcement in March, so found by accident when looking up next visit. I too am very disappointed that "Das Liebesverbot" will not be performed, after Kasper Holten informed me (just before he left) that as far as he was aware it was in the Spring 2019 schedule. I guess I'll have to make do with the Opus Arte DVD (perhaps that was always the plan) and memories of Nottingham Uni's performances in English. Also, why only "Die Walkure" live to Cinema, and not the whole "Ring"? Feel privileged to have seen it all in the flesh last time round, but can never get enough in the north. Sorry to disappoint - it wasn't possible to fit the entire Ring cycle into this Season's cinema schedule. We try to balance the schedule and are of course restricted by financial and legal considerations, so we have taken the decision only to broadcast Die Walküre. I'm most interested to learn if Anna Netrebko will appear on Sunday but that's off-topic. 2018-19 has some very exciting operas amongst the necessary repeats. Loved both Cosi and Carmen and the new productions look unmissable. Symphony in C is my favourite ballet but I'm disappointed not to find a revival of the dazzling Symphonic Dances. Can you do something about the weather (that was a joke) - or offer more early starts/finishes? Transport isn't reliable around London when the weather isn't great. The snow kept me away from both Tosca and the Bernstein ballets (none of the three seem to be coming back next season), though I did learn that you have a rather wonderful ticket return procedure. Only one non-20.00 start for Katya (I know it's short but...) for people who live outside London? Hopefully, as with House of the Dead, there won't be an interval. Surely not enough early starts for family-orientated Haensel und Gretel? Yes, we're all hoping Anna Noshow will turn up. Richard, I have just returned from the Macbeth rehearsal at which Anna appeared and seemed in excellent form. Like you I am also wondering about whether there is a JPYA production this autumn. The new brochure and magazine which arrived in today's post gives no details but there is a reference to the "annual chamber opera production" so perhaps it will be announced later. Netrebko not only appeared at the General rehearsal this morning but also sang a glorious Lady Macbeth. So fingers crossed for Sunday! I wish you would do Turandot again - that was fantastic! the ballet season is absolutely superb !Firebird , Patineurs , A month in the country , winter dreams ... LA BAYADERE !!!!!! Why the Nutcracker again??? Show a little imagination. There are other ballets you could do at Christmas, how about Ashton's Cinderella, that hasn't been revived for a while now. Apart from that lovely to see Romeo and Juliet return and La Bayadere. Some great revivals coming next season, especially Carlos Acosta’s “Don Quixote”! Also excited to see “A Month in the Country”, “La Bayadere”, “Mayerling”, “Les Patineurs”, “Flight Pettern”. I could live without “The Nutcracker” yet again, even though I realise it is a best seller and a fabulous production. How many consecutive seasons have we now seen it? I think this is the fourth. I have to say, this programme is sufficiently disappointing that I almost wonder if it's worth my renewing my membership. It's a great shame that we seem permanently to have lost some of the rarities planned by Kasper Holten (including Das Liebesverbot and Der Freischutz - the latter a work which should be standard repertoire worldwide). Instead we have far too many revivals of things that have been at Covent Garden very recently (do we really need to revive the new Carmen immediately? - let alone for two runs). I shall be happy to see The Queen of Spades, Kat'a Kabanova, Hansel and Gretel and Billy Budd, but I really think the ROH needs to make a solid commitment to bringing more real rarities back into the repertoire on a regular basis, as most German houses seem to have no problems doing. Queen of Spades is great, but it will be my third chance to see it in or near London; Tchaikovsky wrote half a dozen operas that hardly anyone has had the chance to see. Why not give us a Maid of Orleans, say? Also, am I missing something, or is there no autumn production for the Jette Parker Young Artists? No mention that I can see of any increase in seat prices for next season. Unless of course there aren't any! Really like the look of the Royal Ballet season. Looking forward especially to Flight Pattern as I missed it first time round and spent weeks kicking myself for not booking. Also Winter Dreams, The Concert, A Month in the Country etc etc etc ! My only question is around cinema screenings. Why are we having Nutcracker at the cinema again? I totally understand why it's on at the House because it always sells out but couldn't we have something different at the cinema for a change? We have been holding our breath, waiting for the announcement of the forthcoming ROH 18/19 season. What a box of delights! Ballet.."A Month in the Country" "Winter Dreams" "Mayerling" Opera..Cosi, Marriage of Figaro, oh so many. For me, G.F. Handel's great oratorio, Solomon, will be high on my list, of not to missed! Looking forward to seeing Royal Ballet's La Bayadere live for the first time. Excited for the winter season in particular - Les Patineurs/Winter Dreams/The Concert, Don Q and whatever the RBS will present alongside Two Pigeons. Then roll on summer for FirebirdMonth in the Country/Symphony in C! Lots to tick off my wish list - some Russian, some American, covers my Macmillan wishlist and an Ashton I've not seen before, however, overall not enough Ashton for my liking, definitely missing a full length ballet - when will Cinderella be back? I was playing some music from La Bayadere last week and it occurred to me that Nikiya was a perfect role for Lauren Cuthbertson! I do hope she will be Nikiya in the Live Cinema performance. Also happy to see Two Pigeons, The Concert and A Month in the Country - can't wait! I hope to see a Bonelli Mayerling. Royal Ballet: Les Patineurs, The Two Pigeons, A Month in the Country, as it's Ashton's anniversary (although I was hoping for Cinderella, Sylvia and Daphnis & Chloe for his anniversary too, but three's not bad). Asphodel Meadows, The Firebird, Flight Pattern and all the new works. Royal Opera: The Marriage of Figaro, Andrea Chénier, Solomon, etc.....but it really depends on the production and the cast. I'm very excited by the Royal Ballet season and especially to see which dancers will be performing. I love Mayerling and Romeo and Juliet and am looking forward to Infra, La Bayadere and particularly Flight Pattern. Really good to see the Ashton choices on the programme, Month in the Country has been on my want-to-see list for ages. Plus Don Q, and - please - Hayward as Juliet. Great to see Flight Pattern back too, such a great work and so relevant. La Bayadere and Symphony in C! Can’t wait! Thank you so much, 18/19 season looks almost frighteningly exciting! Nutcracker AGAIN at Christmas! Happy to see some Ashton, but miss Fille. On the PDF file in the press section, there is the date of Solomon. However, in the winter section, http://www.roh.org.uk/seasons/2018-19/autumn, you seem to forget to put the date. La Bayadère, The Firebird and Les Patineurs. Delighted as felt very deprived of a varied ballet programme this year, Wonderful season to look forward to. This has to be one of the most boring seasons as far as the Opera is concerned. Let more Traviatas (I thought that production had been pensioned off) and revivals of Carmen (two lots) and that ghastly Cosi fan tutte. But Ermonela Jaho as Violetta in Traviata is not to be missed, based on her outstanding Butterfly last season! Would Shehrazade ever be brought back? I remember seeing it in Leeds about 35 years ago. My favourite music too. Will Osipova be featured in any of the ballet screenings? I hope so. Please please please, would you broadcast Simphony in C in cinemas? Not wildly exciting. Always grateful for bits of Ashton and a healthy dosis of the great classics. Agree that perhaps Nutcracker again is a bit too much of a good thing (but acknowledge that money needs to be made). Agree with suggestion to remind us of Ashton's Cinderella. Robbins and the Concert - oh yes! But why no more Dances at the Gathering? Don't tell me you don't have the dancers for it, because you do! Not sure that all the recent modern ballets deserve being revived (some very boring choreography, some very good designs, some utterly terrible "music", always brilliant dancers who do their best to defend the new works) and therefore will probably give most of the triple bills a miss. Might go and see an opera instead. A very mixed season with little to be enthusiastic about apart from the obvious Forza. A new production of Hansel and Gretel Why? how many performances did the new production in the 2008/9 season have? Not many. What has happened to the Aida production hasn't been seen for 8 years? Why spend so much money on new productions that are then left to gather dust. It's so exciting, specially La Bayadere. It'll be a great season!! By the way, when will you be releasing more DVD's from the Royal Ballet? Can't wait to get them. Everything will rightly be eclipsed by "The Ring" (only one performance, Walkure, live in cinemas though) and I am lucky to have my tickets. Creeping under the radar is a revival of Traviata that might be special with Ermonela Jaho in the title role...I will never forget her sensational performance as Butterfly. A new Katya Kabanova has a lot to live up to...will it stand up to comparison to the wonderful Nunn/Mackerras production? The hype will go to Kaufmann and Netrebko in La Forza but for me, its the Janacek that is most intriguing. I agree with others when it comes to the ballet - we do not need another Christmas Nutcracker. What's wrong with Sleeping Beauty or Ashton's Cinderella as a Christmas treat? I know these things take planning but any chance of a revival of Tristan und Isolde sometime? Rather disappointing, tame opera season for 2018/19 frankly, which will at least save me money because there's not much I want to see. 'The Royal Opera is also planning a cycle of works for families over the next few Seasons'. Why? Is that really what an international opera house should be doing on its main stage? I guess it means that the darker aspects of 'Hansel and Gretel' will be avoided so as not to upset children, which is the drawback of staging an opera for 'families'. '[T]his Season nods to The Royal Opera's heritage, with a performance of Handel's oratorio Solomon': shame the 'nod' couldn't stretch to mounting a new production of one of the operas. Ah well, at least there is 'La forza del destino' (if all the singers show up), 'Katya Kabanova' and 'The Queen of Spades'. Some great stuff here! I really hope Muntagirov is given the chance to dance Rudolf in Mayerling this time around. He is a great actor and needs a role like that to really bring this out. and untrue - stereotype that the ROH is for those who no longer have to work (or who never needed to). They do replays on Sundays if you check this out. Please return the previous carmen. The new production does not provide any insight into what drove carmen to self destruction. Most great opera singers make some interpretation of what drives her and that is why we see it again and again. This current production is just fluff. Superficial and more like west end theatre than opera. Could be sung by anyone. Аll of the ballets. I'd also like to see again Acosta's "Carmen". I saw it 3 yeas ago and it was amazing! Yes. amazingly awful. Please consign this dreadful production to the waste bin. Will be boring ballet season. You stick to classic well known to all of us and seen so many times. You need more exciting, new, inventive repertoire and to be brave to experiment. This is comfort zone. The truncated version is what Verdi wrote for the original version of Forza. Not a single opera on the main stage by a living composer. Unbelievable. If we had to depend on ROH for a rich, varied, annual diet of Handel/Baroque opera, we would STARVE to death! Fortunately, we have the likes of the London Handle Festival, and last year's Monteverdi trilogy served up by Sir E. Gardner, and the Early Opera Company to keep us well nourished. 'Opera-before-Mozart' will always be a niche market, so we are always grateful when a national opera house like ROH (that has to be popular to the general, ticket-buying public) still remembers to sponsor Baroque opera, like Ulysses at the Roundhouse in Jan of this year and Solomon in the 18/19 season. And yet, London is in a unique situation in that this was the city where Handel wrote all of his great operas/oratorios--it should be a point of national pride/duty that the leading opera house of London should continually showcase Handel's wonderfully varied operatic genius, as well as keeping his work in context with other operatic composers of his era. Let's hope Osipova gets some broadcasting. I'm still heart-broken remembering her in Giselle! No Sonya Yoncheva for the second season running??? Really Royal Opera House? The highlights for me have to be "Forza" with Jonas Kaufmann, "Queen of Spades" with Eva Maria Westbroek and the revivals of "Traviata" with Ermonela Jaho (I know all the complaints of "Traviata yet again", but with this casting it's likely to be very special) and Faust with Michael Fabiano and Erwin Schrott. Disappointing that the new and highly controversial Carmen is getting two outings in the season, and that we don't get to see Nicole Car or Juan Diego Florez who hasn't been here since 2015! Please can we have a break from Nutcracker! Bring back Cinderella or have a double bill of Beatrix Potter and Les Patineurs. Too many Nutcrackers in London - ENB also doing it again! Coppelia is yet again excluded from the ballet programme! It is several years now since I saw the Royal Ballet perform this delightful ballet! Also, Porgy and Bess has not been performed, as far as I can remember, since the early 1990s! Why is this? It is such a wonderful opera! Well rounded female characters are not to be expected in any productions by this particular Carmen director. Delighted to see La Bayadere and Don Quixote will be in cinemas, disappointed to miss Symphony in C.
Dear Mr. O'Hare, thank you for presenting us ballet lovers with a most wonderful upcoming Ballet Season 2018-2019, so many exciting ballets to choose from, well-balanced between the great classics and the contemporary. We very much enjoy watching all your amazing dancers in the various ranks and we also hope to have the pleasure of seeing your Principal ballerina Miss Naghdi a lot more on stage next Season. However, my wife and I are sad there will be no "Onegin" and "Concerto" in the upcoming season. With the upcoming 3-act Katya Kabanova next season and the current 3-act From the House of the Dead both of which productions are performed without interval(s), it would be interesting to have a discussion on why so many directors insist on cutting one or more of the intervals which the composers included - usually for dramatic reasons - in their operas. I assume that directors will claim they need through-performed work to maintain dramatic tension, but frankly if they can't keep the dramatic tension for successive acts because of an intervening interval they shouldn't have been contracted in the first place! Often significant intervening action takes place between acts. For example, at the end of Act I of KK, Tichon "bows to Kabanicha and kisses her and Kát'a before he departs"and right at the start of Act II "The women are working on embroidery. Kabanicha criticizes Káťa for not appearing more sorrowful at Tichon's absence [a rather short one of a couple of minutes if the acts are sandwiched together!]". Again from the end of Act I (this time From the House of the Dead) "Goryantchikov is dragged in, half dead" and right at the start of Act II "Six months later, at the Irtysh river - Goryantchikov has befriended the young tartar Alyeya". (Wiki again) Are there any known examples where a director's wish to cut an interval was over-ruled (except for scene-change reasons)? There are, of course, examples where cutting an interval CAN maintain the dramatic flow. No time passes between the first 2 acts of La Boheme, nor between the first two and the last two of Swan Lake. And then there are the possible comfort issues for many patrons!!! Yes yes - what about Wagner I hear readers say! The difficulties for some of surviving Rheingold, Dutchman or the 2 hour acts in Parsifal and Meistersinger are no justification for imposing them on other works! Do opera houses always submit meekly to directors' wishes, wincing meekly at the tens of thousands of £££ they must lose at the bars for each suppressed interval? oh I so hope Steven McRae will be on the relay of Maylering..and/or Don Q. the man is pure genius. Shame that Hansel Und Gretel isn't getting a cinema broadcast. Also, in your 2013- 2020 comissions announcement, you announced "an adaptation of Alice Through the Looking Glass by Unsuk Chin and librettist David Henry Hwang for the main stage in the 2018/19 Season." I was very much looking forward to this. Has it been cancelled altogether or just been pushed back till 2020? After having looked at the whole season in more detail I can see that there are a few more choice productions to look forward to, even though everyone will be booking for the new Forza with Netrebko and Kaufmann ( and it's being broadcast ) for me the choice is the revival of Fille du Regiment with the extraordinary Sabine Devieilhe who was amazing as the Queen of the Night. Originally done for Natalie Dessay this looks like a very exciting revival, and the Symphony in C by Balanchine is coming back what more could one want ? Ok it's not going to be the perfect season for everybody but if you look hard enough there are a few gems to pick from, Andrea Chenier with Radvanosky and Alagna, Faust with Damrau, Boris Godunov with Terfel. Some good singers, true, but Terfel, for instance, did Boris the first time round (and really, we ought to hear the revised and improved version with the Polish act! - I think Covent Garden is missing a trick by not giving us the opportunity to compare them both). In any case, I think the ROH needs to look seriously into widening its repertoire. There's not a single real rarity this season. I must confess to some disappointment at this season. I wish Oliver Mears well in what I suppose is the first season that he has fully programmed, but it's a great shame that we seem permanently to have lost some of the rarities previously planned by Kasper Holten (including Das Liebesverbot and Der Freischutz - the latter a work which should be standard repertoire worldwide). Instead we have an awful lot of revivals of things that have been at Covent Garden very recently (I'm not sure I really understand why it's necessary to revive the new Carmen immediately - let alone for two runs). I shall be happy to see The Queen of Spades, Kat'a Kabanova, Hansel and Gretel and Billy Budd, but I really think the ROH needs to make a solid commitment to bringing more real rarities back into the repertoire on a regular basis, as most German houses find themselves able to do routinely. Queen of Spades is great, but it will be my third chance to see it in or near London; Tchaikovsky wrote half a dozen operas that hardly anyone has had the chance to see. Why not give us a Maid of Orleans, say? Just received the latest ROH Magazine. No mention of ticket prices. the only price indication we get now is a range at the bottom of the page, see page 58 onwards. Varibale price bands, no up-front information, no printed seat map, they are trying hard to make it as difficult as possible for us. I experienced and it costed me dearly your Carmen version. I will never set foot again there and I'll do my best so that none of my acquaintances ever go (not even my enemies). There are several operas that look interesting, especially Andrea Chenier one of my all time favourites. Such a pity that its not going to be available in the cinema again. (I missed the 2015 screening). However I hope that as with the Turandot, ROH may decide to live screen it, please! The 2018/19 season is really exciting for me as a ballet fan. There many of my all time favourites (Mayerling, La Bayadered, Two Pigeons, Symphony in C, Month in the Country, Flight Pattern) some welcome returns among them, the prospect of interesting new work alongside iconic pieces - and only a couple of potential duds in the mix. Well done Kevin O'Hare! Then there's Open Up! I think that everyone was fearful that it would be too heavily focused on eating and drinking rather than the performing arts we so admire and love; but the companies seem to be genuinely striving to make their work more accessible. Well done to all! Lastly, there is the promise of some simply wonderful debuts by the Royal Ballet's roster of amazing dancers. I've got my fingers crossed for Muntagirov in Mayerling (please), La Bayadere, Winter Dreams and Month, Ball and Clarke in Winter Dreams especially, Corrales in Don Q, Magri in Don Q, new casts for Frankenstein, Takada and O'Sullivan as Juliet - oh, I must stop! Can't wait - but, first there is going to be much to marvel at in the rest of this season. We are soooooo lucky! Very excited for the Royal Ballet's new season!! La Bayadere finally! Since I can't go to live performances, I just hope to see Marianela as Nikya or Juliet in the cinema relays. The choice of works for the opera season is very "safe"...?! Ok, it is a western and northern European heretage, but the composers for it are much more widespread. There are plenty of unjustifiably neglected works even within that set. Please accept our apologies for the inconvenience. The pricing will be available on the website soon. I simply cannot believe you are bringing back Carmen for both Autumn and Summer. Another plea for a revival of the wonderful Four Schumann Pieces by Hans van Manen. Also Five Tangos which I saw in Winnipeg in 1983 danced by members of the Winnipeg Ballet and the Birmingham Royal Ballet - super. What saddens me particularly is the quality of the conductors: in earlier years Pappano attracted some very distinguished protatogonists to the house: now we have routiniers such as the Daniels Oren and Ettinger who have have led some of the feeblest outings of recent years: economics again I suppose. What a thrill, therefore, to see John Eliot Gardiner returning, this time, to illuminate an undoubted masterpiece. Still no Beatrix Potter! Please please schedule this before my grandchildren are too old to fully appreciate the magic. As ever very little to get excited about in the Royal Operas new season. It would be great to know the opera casts, as that makes a great deal of difference as to whether I will bother to visit the ROH next season as I live in Lisbon. In Lisbon we get 6 to 8 operas each season, which are usually far more exciting that the ROH offering. Here we can not afford the great singers of today, but usually the performances are far more satisfactory than the ROH. The RoH repertory is small and dull, with unexciting casting on the large part. In other words get your act together and start doing some rarer operas with decent casts. May I ask why my comment of 21st March is still awaiting moderation? We aim to publish comments within 24 hours but sometimes it takes a little longer as we have to investigate questions asked or comments made. In this case we've had a lot of comments about the launch of the Season so it's taking a little longer to get through them. Thank you for commenting and we will moderate as soon as we can. The absence of any work by a living composer shows a sudden lack of ambition, a narrowing vision of what opera can achieve, a sudden mis-step in the confidence that has defined the ROH in the last decade. There are great operas to look forward to, but this programme is more comfort blanket than art-house. As to the cast-list issue, some of the best performances I've seen involved singers I've never heard of, and the greatest Grimes I've ever heard was a last minute stand-in, whose name I've long forgotten, but whose voice I can still remember; he wasn't a singer, he was Grimes. You can't ask for more than that. I agree with the comments of Alexander Jacoby above on the opera season, especially about Der Freischutz. The ballet season is much more interesting, particularly the triple bills. It is a shame Cinderella, Daphnis and Chloe, DGV and Voluntaries aren't scheduled but let's hope they turn up in 2019/2020. Are there plans for the new Linbury theatre to offer more pre Mozart opera ? We'll be announcing the Linbury programme in due course on our social channels and on the website - all will be revealed soon! Surely the Linbury programme ought to have been announced along with the rest, in the traditional way? Of course, we would usually have announced the programme for the Linbury by now - but this year we are doing things differently as we are entirely reopening the space. We will be announcing the programme later in the year and giving it the time and space it deserves. Someone at the Royal Ballet seems to have forgotten that 2019 is the Fonteyn centenary year. Shame on them. Please, Kevin, can we have a break from The Nutcracker. Please, could we have revivals of more Ashton's wonderful works, also De Valois. Kevin, just in case you have forgotten, De Valois was the founder of The Royal Ballet. I agree. Fonteyn's centenary (19 May 2019) would have fallen on a Sunday but the Royal Ballet have 2 performance slots on the eve of that day, and while I love Flight Pattern and Within the Golden Hour as well as being excited about a new ballet, surely a revival of an Ashton full length ballet/mixed bill associated with Fonteyn would have been apt (plus you get both Ashton and Fonteyn anniversaries in one) - eg Ondine, Sylvia (judging by how popular Sylvia was in November and December last year, this would have sold out again), or Birthday Offering + Daphnis & Chloe, Les Patineurs + Daphnis & Chloe, or perhaps Symphonic Variations + Marguerite & Armand + Birthday Offering. It's also been too long since we last had de Valois' Checkmate and The Rake's Progress. What I find disappointing about this season is that there is not a single opera which has not already been done during the 25 years I have been going, so nearly everything I have already seen there at least once if in a different production, the exceptions being ones I am not keen on. There are a lot of operas that I have never seen at the ROH, or possibly never at all, and those are what would make me excited. Re: the weeknights live broadcasts. I agree that these raise problems for working people. Where I live in France, they cause problems to non-working people as well. I need to drive 90 minutes to the nearest cinema, with the hour's time lag, that means one arrives back home at 1 in the morning. There is no way I can take any children from the local ballet school to those Live performances - they need to be back at school at 8 am! And I don't remember many (any?) Live shows during school holidays. The Encore (replays) on Sundays are very few and far between. Moreover, the cinema guide is frequently incomplete, so I have to go through every single "local" cinema's programme to find out whether there will be a live or an encore show. I am all for new dance pieces, but the company mustn't be afraid of decluttering at the end of the season. Munich ; Paris and Milan have much better seasons (and equal budgets).... are we already rehearsing opera Brexit? I do not think that the opera season looks that enticing. Was it really necessary to revive the disappointing new Carmen so soon after its premiere? The fact that it is back only months after it was first staged combined with the revival of La Traviata in a production that we had been told was going to be scrapped suggests that the opera company may be trying to economise which may not be such a bad thing given the number of dud productions which have been staged in recent years. Economy is one thing but reviving the new Cosi and the new Carmen in the same season strikes me as inflicting cruel and unusual punishment on the London opera going public. The Cosi is stuffed full of clever ideas that don't work while the Carmen is interminable. I was looking forward to. Andrea Chenier until I saw who was conducting it. I am not going to get too excited about the season's new productions as recent experience suggests that optimism about them is likely to prove misplaced. The ballet season looks far more promising and I am sure that it will look even better when the casting is announced. I am not sure why the MacMillan celebration seems to have spilled over into the 2018-19 season. It seems a trifle excessive to me particularly as there is nothing in the ballet programme to suggest that the centenary of Fontyn's birth in May 2019 is being marked in any way. But perhaps the company intends to programme a series of ballets associated with Fonteyn during the 2019-29 season. Ballets such as Daphnis and Chloe, Symphonic Variations, A Wedding Bouquet, Sylvia, Ondine, Birthday Offering and Sleeping Beauty spring to mind in the context of the anniversary. Perhaps I am being overly optimistic here as the company seems to be managing to mark the Petipa bicentenary by staging versions of ballets which he created in which he would be hard pressed to recognise his work at all. Both the company's Don Q and its version of La Bayadere are very much twentieth century "after Petipa" reworking of his original works. Isn't it time that the company rediscovered its sense of history and started to think about staging serious historically informed reconstructions of Petipa's works? As far as Christmas is concerned do we really have to have Nutcracker every Christmas? There was a time when Covent Garden was a Nutcracker free zone and ballets such as Coppelia, Cinderella, Fille and Sleeping Beauty were staged at Christmas. I can't help thinking that the company would be doing far more to develop the next generation of ballet goers by providing a wider range of repertory at Christmas than an unvaried diet of annual Nutcrackers. We are visiting London for a month..
mid AUG.. - mid SEPT.
Do you take a summer break? Yes, we have a break during the summer months. Our 18/19 Season opens with the Ring cycle on 24 September. What happened to the previously announced new production of Britten's Death in Venice conducted by Mark Elder. Has the new BIlly Budd replaced it for some reason? When will we be able to see Pricing? Your website is still showing the Winter Pricing Grid, not even having moved on to Spring. Really love the ballet program of 2018/19. I am so happy to see RB is reviving so many past productions that have not been staged for a long time. Wishing to see Ms. Yuhui Choe on more principal roles, as she has been casting lesser major roles this year. Delighted to see Romeo & Juliet on the schedule. I will never forget seeing the Royal Ballet's R&J in Philadelphia in 1976, when they came to the US to help commemorate 200th anniversary of the Declaration of Independence! I'm equally delighted to see Benjamin Bernheim scheduled for Traviata, but it is too bad you have the insufferable Michael Fabiano in Faust instead of Bernheim, who has just made his US debut in Faust in Chicago -- and a superb debut it was. No Meyebeer (again! )*, the only French opera is Faust (and we all know that doesn’t really count as grand), no Verdi in the Summer booking period, a double airing for the appalling ‘Family Guy’ Carmen, Alagna but no Kurzak, Gheorghiu for only 2 Toscas (just like this season!) and complete opera drought for the first half of January. Queen of Spades and Forza look fantastic but Katya Kabanova, after the sales slump for From the House of the Dead, and Cosi Fan Tutte which barely sold in its initial run? No Rossini and Bel Canto barely represented by the overexposed Fille du Regiment. Were there cancellations to allow for the double run of Carmen and returns for Traviata/Tosca? *Sorry to tubthump, but given the extent of the Meyerbeer revival in continental houses (JDF in Les Huguenots in Berlin, fresh critical edition of L'Africaine as Vasco da Gama, the increasing pertinence of Le Prophete in our age of religious extremism and confessional strife) it's getting embarrassing that ROH hasn't touched a Meyerbeer opera since Robert Le Diable in 2013 (and given the casting debacles then it was hardly a fair hearing for a Meyerbeer opera). Damrau, Jaho and Hymel are singing Les Huguenots in Paris: will we always have to go abroad to see these masterpieces?! Please don't complain about Kabanova - it's one of the very few worthwhile things next season. If you go to opera looking for real music drama (i.e., plausible things happening to real people expressed through song), Janacek is unsurpassable. Oh, I do hope so. I've never yet heard any Meyerbeer that amounted to anything more than three or more hours of ninth-rate aural wallpaper, or as Wagner said "All effects without causes". Meanwhile, in the real musical world, no Strauss, grrrrrrr. Of course, Strauss is much the greater composer, but Meyerbeer's pretty good. Better than Verdi, for instance. Les Huguenots is pretty close to being a masterpiece. I also heartily endorse the above comments that the centenary of Fonteyn's birth seems to have been forgotten and, perhaps even more serious, so has Robbins' centenary this year. The Concert is the only one of his ballets on the programme for next season. Just about all the most important companies in Europe (e.g Stuttgart, Hamberg, Paris Opera Ballet), not to mentions masses of American companies, are doing Robbins centenary programmes. If the RB were doing a Robbins centenary I would even consider making the journey to London (and I'm in my late 70s) , especially if Dances at a Gathering were included as I have yet to see it on stage and have only seen it once live streamed on Internet. As it is I shall be going to the "Etés de la Danse" in Paris which has organised a superb "Hommage à Jerome Robbins". Has the Royal Ballet really forgotten Fonteyn's centenary next May? We've just been marking Bernstein's centenary with a special triple bill, when Bernstein's connection with the company is minimal (much as I like his music). Fonteyn was crucial to the company's development and is probably still the best known ballerina in this country (though Bussell may be challenging that now with younger people). Fonteyn was also crucial in the creation of the British style of ballet and created so many roles, and with Nureyev became a ballet superstar. How can it be that her centenary has not even been mentioned let alone marked?? Two more comments: 1) This year is also the bicentenary of Petipa's birth!!! Where would the Royal Ballet be without Petipa?!! But no sign of a Petipa celebration!! There has just been an international congress to celebrate the bicentenary at the Vaganova Institute in St Petersburg and I'm proud (as a naturalised Spaniard) to be able to announce that Madrid is hosting another one entitled "Marius Petipa: from romantic ballet to classical" over two days in October (proposed lectures can be submitted until June 15th) but where is the RB's celebration of the man who could arguably be described as the most important choreographer of all time? 2) Unlike several commentators I am not averse to another season of Nutcrackers, including a live stream in the cinema. It fills the cinemas here in Southern Spain to the extent that our group of 4 had to split up last December. One of my friends never ceases to ask me "When is the Nutcracker on? We mustn't miss it." It is many, many children's first taste of ballet and I recently overheard a comment by a ballet teacher in another part of Spain saying " I've got a class full of boys, more boys than girls. They are all terribly keen and that's due to the Nutcracker!" What better reason for showing it every year in the cinema? And, after all, Peter Wright's production is quite superb. I have never seen another that came anywhere near it in quality. Hard to decide!!! All of them beautiful!! As someone who only gets to see the ROH because of their Live at the Cinema Season - which I am so delighted about - as regards both opera and ballet - but so disappointed that yet again we are going to have The Nutcracker shown once more - please can we have a change as suggested by previous posters such as Cinderella or Sleeping Beauty - please, please, please! I enjoy seeing different and for me new ballets such as the Bernstein trio for his centenary and Balachine's Jewels and with just 6 Ballets shown in the Cinema each year I would really love to have the opportunity to see a different ballet at christmas instead of the traditional Nutcracker - so many years in a row becomes boring and means I don't bother to go which is a real shame. Loved Macbeth in the cinema last night, excited at line up for Forza next year, shame you are repeating tired old Traviata next year. Where is the new production of Swan Lake ? I cant see it on the listing ? Has it been postponed ? I would like to add my voice to those requesting that the Royal Ballet mark Fonteyn's centenary at some point. Per favore BASTA Schiaccianoci, non se ne può più. I’m very excited by the 2018/19 program, both ballet and opera. I try to go to EVERYTHING in the very cheap seats. And occasionally splash out on a treat in the more expensive seats. A question - there is(are) no date(s) for Solomon. Pricing yes. Date no. Please let us know. I’m also looking forward to the reopening of the Linbury. Can’t wait! Can’t see tickets on sale, can someone confirm? Pleased to see Forza which I've not seen for years, but disappointed that Billy Budd not on cinema list. I can't see any tickets on sale too. What's happening? I often go to a different Ballet, the Royal Ballet was no exception. The news is that there will be a new updated program together with modern and new works, with five world premiers, including a new ballet from Alastair Marriott, commissioned by Dario Marianelli, with the design of Es Devlin. This is just one more reason will be prepared in advance for the season. We often like to arrange such evenings with my colleagues from GreatPaper , and spend them watching the opera or ballet. This year I hope will not be an exception, and we will visit at least a few performances. And I'm glad that in the season included a series of revivals of the 19th century, including: "La Bayadere", "Don Quixote", "The Nutcracker", it's just incredible! Thank you for a rich season, but I agree with other comments that the operas chosen are relentlessly safe, regularly performed works. Replacing the planned Konigskinder with Hansel and Gretel was disappointing. Would be great to explore at least some adventurous repertoire - Meyerbeer, Hindemith, lesser performed Richard Strauss and Tchaikovsky. Neglected ballets include anything by Massine (Choreartium, Les Presages), or epic Russian classics (Fountain of Bakhchisarai, The Bronze Horseman). The Royal Ballet doesn't have the rights to those Russian ballets - some of the choreography has been lost eg Les Presages- so if mounted at all it won't be the original. The Mariinsky currently has a production of Fountain of Bakhchisarai but you'd have to persuade the Victor Hochauser company (their impresarios) that it's worth the financial risk for them to bring it on tour. I expect it will do well for 2 performances, possibly 3, depending on the casts. Birmingham Royal Ballet presented a critically successful reconstruction of Choreartium about 2 decades ago. Samira Saidi, who performed the lead in one of the movements (and was truly unforgettable), for example, is now a Head of Department at the Royal Ballet School and her son dances in the Royal Ballet so that's a while ago! -but you could write to David Bintley to see if they might revive it for the current dancers. So, I know its REALLY early to ask this but is there dates for when Ballet will perform in Los Angeles? or can you say what the venue is so i can stalk them all year till tickets are available? Them coming to my side of the country is a experience and convenience i would be an idiot to let pass. I am sorry there are so many negative comments above. I can only see the live screenings. Would it be possible for the ROH to liaise with the RSC if an opera is derived from Shakespeare? I missed the Verdi Macbeth because I was given a ticket for the RSC production a week later and did not realise until too late. And two Toscas a few days apart at the Met and the ROH wasn't a very good idea. Could you please tell me if you are going to realease the Ashton triple bill on dvd? (The Dream/Symphonic Variations/Marguerite & Armand) I live all the way in South Africa, but have pretty much all your dvds- except these lovely works! I am hoping to seeing anything with your greatest ballerina Natalia Osipova in it. MacBeth was fabulous and the past several years programme, likewise. I am in Sydney, Australia and adore the ROH operas and ballets. Too old and poor to be in London for the live performances. Can you please broadcast the live cinema relay of La Bayadère to Indian cinemas? We have a lot of ballet fans here, and La Bayadère, set in ancient India, will certainly attract many viewers. I simply adore Mayerling, but am disappointed that the fabulous and charismatic Francesca Hayward is still not getting Mary Vetsera. Here is a principal dancer who looks young enough to approach Vetsera in age, and what does the management do? Make poor Frankie wait till she is Lynn Seymour's age when she created the role? Management not only make "poor" Francesca Hayward wait to dance Mary Vetsera... but also poor Yasmine Naghdi! I hope to see Natalia Osipova and Steven Mcrae dance together as Kitri and Basilio in the live screening for Don Quixote. No other dancers capture the essence of these roles except for Nunez. But she was already featured in the last screening for Don Quixote and will be featured in a lot of other ballets for the upcoming season. And we would like to see variety and new faces. Same goes for Sarah Lamb. Both are beautiful dancers but it seems like management has forgotten other dancers exist -- dancers who are just as capable or even more capable in certain roles. Lauren Cuthbertson is rarely featured in any of the live screenings for the classics when she embodies that pure English line and style; Ryoichi Hirano is an exquisite, masculine dancer/actor but never as "advertised" as the rest of the male principals or soon-to-be male principals. Why? I would like to see Natalia Osipova perform more in the live rehearsals and be partnered with suitable male dancers -- when everyone else seems to have their 'go-to' partner. I would hate to see one of your great dancers neglected. Akane Takada, Francesca Hayward, and Yasmine Naghdi are also phenomenal dancers/artists. Yes, they are young. But Nunez was also featured in dvds in her early years. On a side note, I would love to see Takada partnered more with James Hay and Benjamin Ella; and Yasmine Naghdi with Matthew Ball. Those are some fine partnerships. Why is Stefan Vinke, one of the worst Siegfrieds around (see facebook: Ditch Vinke), going to be inflicted upon us again? Surely the Royal Opera could have found someone who is capable of singing the part? Would love to see a production of Weber’s Opera Oberon (written and premiered in London) as well as all his operas. Re ballet, will there ever be a revival of de Valois’ Rake’s Progress? I saw a snippet (Wayne Sleep as the dancing master and Stephen Jeffries as the rake) at a gala (de Valois’ 90th birthday?) and never forgotten it. Rather a pity that 18 May 2019, which is going to be a Saturday and the centenary of the birth of Margot Fonteyn, one of the Royal Ballet and the Opera House's legendary stars- who brought renown to the company as well as to Covent Garden as both a homegrown and internationally recognised star, is virtually going ignored. On a day where 2 performances (matinée and evening) could be scheduled, neither will contain any works associated or related to Dame Margot, as beautiful as Infra, Flight Pattern and Within the Golden Hour are. Since ballets and operas can overlap (ie performing more than one programme within the same week) it seems strange that Romeo and Juliet - a role she was famous for - wasn't brought forward, nor were ballets like Les Patineurs or Firebird (she created the role of the White Couple ballerina and was one of the first interpreters of the Firebird when the ballet was mounted on the company) considered for a second run in spring to coincide with her anniversary. Or indeed Symphonic Variations, also created for her by Ashton, which was so successful for all 3 casts in 2017. Is the company allergic to paying tribute to significant birthdays? Yet this year they seemed to have no problem joining in the international celebration of Bernstein, who is no doubt a genius but not actually particularly associated with the Royal Ballet or Covent Garden. The company never acquired Fancy Free, West Side Story Suite or any ballets he collaborated on with Robbins (nor did they ever commission ballets from him). Neither have Candide or Wonderful Town (the two most "operatic" in style of his musicals), or indeed any of his musicals or his theatrical Mass been presented by the opera company recently (or ever?). Surely it is not due to box office considerations, as there are far more people I know of who would get tickets specially for programmes (a concurrent exhibition would have been popular too) associated with or bearing Fonteyn's name - Ondine, Homage to the Queen, Symphonic Variations, Daphnis and Chloe, Le Corsaire pas de deux, Birthday Offering, Marguerite and Armand, etc - than the number who actually wanted to get tickets for ballets remembering Bernstein (although that turned out to be a superb triple bill in the end). All the Bernstein fans I knew went to the concert halls/symphonic halls instead. This would also have been a great reason to revive Cinderella this year in April and May, which many fans have been asking for (it doesn't have to be confined to Christmas). Although the role was created on Moira Shearer, Cinderella was also one of Fonteyn's notable roles and together with some Ashton mixed bill ballets created for Fonteyn, would have made a popular and successful fortnight of programmes. I am shocked and dismayed that the Royal Opera House will not be celebrating the 100th birthday of Margot Fonteyn on Saturday, 19 May 2019. I was fortunate to see her many times in the later years of her career and the magic of her stage presence was unforgettable. I have just seen the Trocks this evening performing Raymonda's Wedding and immediately it brought to mind Fonteyn clapping her hands strongly in the Raymonda solo and dancing with such poise and authority. The ROH development department use Fonteyn's name unashamedly in the fund-raising through the Fonteyn Circle. Both the ROH and the members of the Fonteyn Circle should hang their heads in shame that they can exploit her name for development, but are not celebrating what she achieved for British ballet and for The Royal Ballet. She was the a key element in the success of The Royal Ballet, when it first visited New York (The Sleeping Beauty) and Moscow (Ondine). I urge ROH management to re-think this diffident oversight and to celebrate Margot's achievements and contribution. She is one of the four founders of The Royal Ballet, commemorated in Westminster Abbey alongside de Valois, Ashton and Constant Lambert. It seems a great shame that Frankenstein isn't included in the cinema offering. Why not? It would definitely be a draw to those new to ballet. Disappointed, but thoroughly enjoy all the screenings, the more the better for me! Definitely time for the Tales of Beatrix Potter, please?! With the Met and the ENO, amongst other houses having already released their 2019/20 season programmes, what has happened to the ROH announcement for next season?